In November, juniors and seniors in Mr. 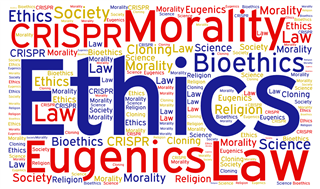 Silk's Ethics, Law & Society class partnered with students at the University of San Diego for a unit on Eugenics. The USD students and their professor, Dr. Laura Rivard, taught the Ethics students about the history of forced sterilization in the U.S. and California, the Supreme Court case that justified the practice, and the current day debate over CRISPR, a modern Eugenics technology. The hands-on unit included a court case reenactment, oral argumentation, and a debate over the application of CRISPR technology. According to Mr. Silk, his students loved working with the college students and tackling the complex ethical dilemmas involved.